OTR Kingscote will offer the ultimate in convenience to make life easier for the community and visitors to Kangaroo Island. The store will have 24/7 services with South Australian roasted, barista made coffee, a carefully tailored range of supermarket essentials and a selection of hot foods in their EAT range. “At a time when unemployment figures are high for regional South Australia, the OTR team is very proud to be creating much needed jobs for local regional communities,” said Peter. “We have kept on all 3 existing staff including Luke Howard who will continue on as Area Manager for the Mogas regional bulk fuel distribution business and Christie Leybourne who will work alongside Luke at Mogas. 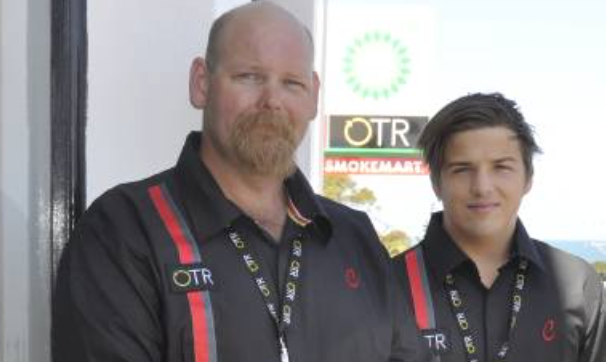 Wayne Klun has been promoted to Shop Manager of OTR and an additional 7 local staff have been hired, half being under 25 years of age,” continued Peter. OTR has recently launched the OTR App, which allows locals and visitors to pre-order their coffee and snacks, and earn ‘Buy 4 Get 1 Free’ value rewards across coffee and food brands. “The OTR App is a faster way to get seriously good, barista made coffee and even better, when you download the OTR App your first coffee is free. The App also offers great value and rewards across our food brands. It really is the perfect time for the Kingscote community and visitors to experience what OTR has to offer,” said Peter. “We are an innovative and dynamic South Australian family business that is proud to be generating jobs and investing in the future of South Australia and we welcome the Kingscote community to our customer network,” concluded Peter. OTR is South Australian owned and operated. Parent company Peregrine Corporation is the state’s largest private employer employing over 3300 South Australians in 2016 they won Australian Retail Awards Retail Employer of the Year. OTR is the states most innovative and leading convenience retailer with over 130 Petrol and Convenience stores across metropolitan and rural South Australia.